Nepal and Tibet combined adventure of lifetime by motorbike in Tibet and thrilling rafting adventure by inflatable raft in Nepal will be recorded as a journey of treasured experience and memories. We bring you the thrill of adventure combined with sightseeing, rafting and motor biking. Pick up from the airport and transfer to the hotel. Meet and collect passports for Tibet visa issuance. Sightseeing tours of the world heritage sites - Kathmandu Durbar square, Swayambhunath, Boudhnath, Pashupatinath temple and Patan Durbar square. We take a 3-hour drive to the rafting put in point of Kaligandaki and start thrill rafting for another 3 hour. The rafting is challenging, full of fun then set the camp, enjoy the evening. Second day; we roll down the raft for about 5 hour enjoying the taste of wilderness of the deepest Kaligandaki gorge and set the camp in the river beach. The next day is our last day of rafting. We will paddle for approximately 3 hour, have lunch and drive back to Pokhara, transfer to the hotel. Morning: flight to Gongkar Airport & Transfer to the hotel in Lhasa (100 Km). Afternoon: free for acclimatization. Lhasa elevation - 3650m. Riding around Lhasa and visit the interesting sites (Potala Palace, Sera monastery, Drepung Monastery, Norbulingka palace etc). We will ride to Ganden Monastery (65 Km from Lhasa) on the day 10. We will drive mostly in paved road even there is off road from the turquoise Lake "Yamdrok Tso" to Gyantse. We will cross two High passes of Kampa La- 4970 m and Karo La-5050m. 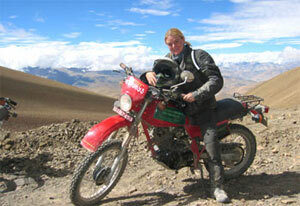 The ride follows the riverbed of the Kyi Chu river in the Bramhaputra valley till Yarlung Tsangpo Bridge. We then take South-East route and gradually ascend to the Kampa La and descend to the Yamdrok Tso riding the numerous bends. Riding through the Lake side, we will be heading to another high pass "Karo La" having the magnificent view of Noji Kangsang Peak (7191 M). Arrive Gyantse, a small agricultural town famous for its wool carpets, sandwiched between ruins of a fort & the Pelkor Chode monastery at an elevation of 4100 meters and transfer to Gyantse Hotel. Morning: we will do a sightseeing tours of famous Pelkor Chode and Kumbum monastery built in 1414 AD. Then riding through the riverbed of Nyang Chu, we will arrive Shigatse early afternoon. Transfer to the hotel and after refreshment will go for another sightseeing tours to the famous "Tashi Lhumpo monastery", the biggest monastery of Gelgupa sect in Tibetan Buddhism built In 1447 AD having its own streets, housing sectors, plazas, back alleys and complex of temples and halls. Today's elevation is 4000 meters. A long ride almost on off road, we will have good breakfast and start for riding through the beautiful villages and the two high passes: Yulung La- 4950 M and Gyatso La-5220 M. After crossing the Yulung La we'll take a branch road to Sakya Monastery, the centre of the Sakyapa sect built in 1079 AD. Stay in a guesthouse at Tingri. We then brive back to the main road and descend into Lhatze, a fertile agricultural town. We will have lunch at Lhatze and start riding ascent to the Gyatso La, finally descend into Shegar & then ride to New Tingri. Stay at a guest house. Elevation - 4300 M.
Today we will find much excitement. Here starts the taste of the "Top of the World"; the remoteness shows the real beauty of the area that makes you pride of your awaiting since long time. Riding through the remoteness you will be ascending to the Rongbuk and stay there for the next 3 nights at the monastery guest house so that won't look for the comfort and luxuriant accommodation in such a sheer remote area, rest of the day relax. Elevation - 4900 meters. We definitely would double the spirit after visiting the base camp of "Top of the World" and be ready for another long ride to Nyalam following the Northwest direction ascending via Lablung La (5120 meters) and Thong La pass. Here, we would see the northern front of the great Himalayan range. A wall of spectacular snow clad giants on the Nepal side of the border. Stay at a guest house in Nyalam. Elevation - 4050 meters. Start 35 Kilometers down hill from Nyalam to Zanghmu, the altitude dramatically chopped by 1300 meters in approximately 1.5 hour. As Zhangmu is the exit point, we would follow the custom clearance, immigration & check post clearance both in Tibet and Nepal border. Continue drive to Kathmandu, transfer to the hotel. Costs associated with cancellations, delays & porters due to roadwork, unavoidable by High Mountain Wave Trekking. In such a situation the use of Porters will cost approximate US$ 20 to 25 person.